Something about this very simple list struck a chord with many educators. Author Bill Ferriter explains: "Kids AREN'T motivated by technology. Instead, they're motivated by opportunities to make a difference in the world; they are motivated by opportunities to ask and answer their own questions; and they are motivated by opportunities to learn together with like-minded peers." 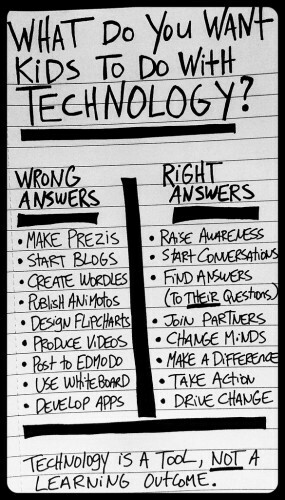 Last weekend, I whipped up a hand-drawn image on the role that technology should play in teaching and learning spaces. Over the last five days, it's been viewed over 4,000 times on Flickr and shared/favorited/retweeted over 500 times on Twitter.